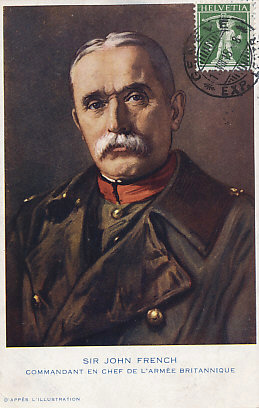 French portrait postcard of Sir John French in Uniform, Commander in Chief of the British Army in France at the beginning of the war. 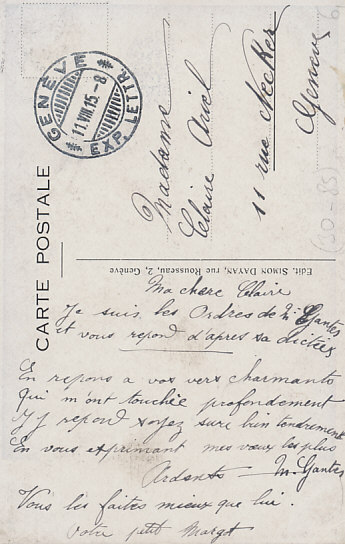 Vous les faites mieux que lui. You can do better than him. Sir John French was Commander-in-Chief of British forces on the continent, the British Expeditionary Force (BEF), from August 1914 to December 10, 1915, when he was replaced by General Douglas Haig. Sir John had a poor relationship with the French, particularly with General Lanrezac, commander of the Fifth Army, to the left of which the BEF was to position upon reaching the continent. During the Allied retreat before the Battle of the Marne, he was prepared to return to the Channel and Britain. In the Battle of the Marne, the Allied commanders were slow to pursue the retreating German forces. The path before the British was open, and they suffered few casualties during the campaign. During the Race to the Sea, the repeated attempts of each side to outflank the other that ended only when the opponents reached the Channel coast, the British were tasked with preventing the German seizure of Lille, an industrial center in northern France. Their failure to do so convinced French commander Joseph Joffre that he could not rely upon Sir John and his British troops. In the fall of 1915, in the House of Lords, speakers began referring to the just-concluded Battle of Loos and the Battle of Neuve Chappelle fought six months earlier as "defeats." The shell shortage, the failure of the Dardanelles naval campaign, and what was increasingly looking like the failure of the Gallipoli campaign, put French's position at risk. Through writing privately to Kitchener and other means, including his close relationship with the King, General Douglas Haig managed to get French removed. Memoirs of the Foreign Legion M. M.